St Mirren are searching for a new manager now that relegation to the Championship has been confirmed. 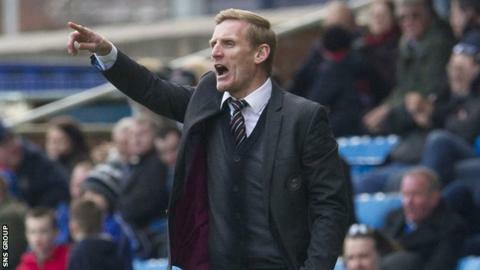 And the Paisley club say they expect Gary Teale to apply for the post he has occupied since replacing the sacked Tommy Craig in December. St Mirren picked up their eighth win of a disappointing Premiership campaign at Ross County on Saturday. But their nine-year stay in the top flight was brought to an end the night before when Motherwell beat Kilmarnock. "As a board of directors we have always made what we believed to be the best decisions for the good of the club," read a statement from the Buddies. "This season, unfortunately, we have got some of those decisions wrong, and we hold our hands up and accept responsibility." Teale, 36, was put in charge until the end of the season and has spoken regularly of his desire to stay on. However, he must now enter an open selection process if he is to lead the team next season. "We are now inviting applications from managers interested in managing this great club with first class facilities and excellent young players," added the statement. "The board would like to place on record our thanks to both Gary Teale and David Longwell for taking over the reins after Tommy Craig's departure and whilst the job of avoiding relegation proved to be a step too far their commitment, effort and endeavour has been there for all to see. "We would expect Gary to put his name forward for the vacant manager's position and we will duly consider his application along with all others we receive."